From glittering holiday decor to special entertainment to tasty seasonal treats, spending the holiday season at Walt Disney World® Resort can’t be beat. 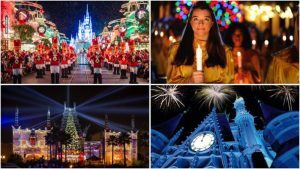 Mickey’s Very Merry Christmas Party at Magic Kingdom® Park – You can experience the holiday party of a lifetime at Mickey’s Very Merry Christmas Party. 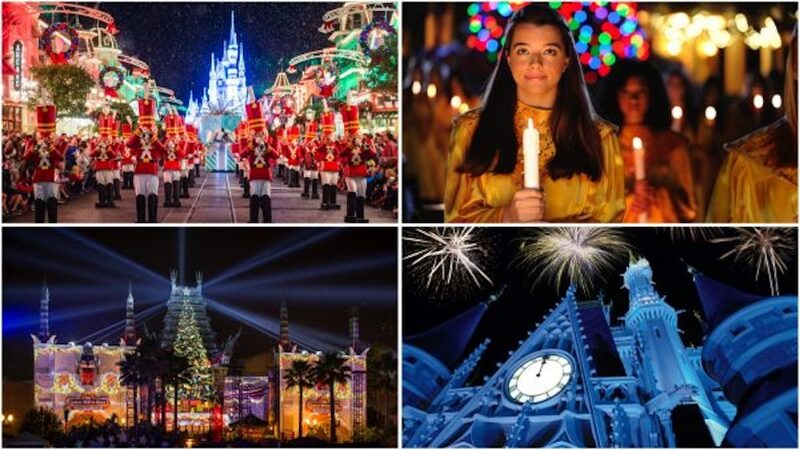 Taking place on select nights in November and December, this Guest-favorite annual holiday event includes a special “Once Upon a Christmastime Parade,” “Holiday Wishes” fireworks, snow on Main Street, U.S.A., and much more. You can also plus up your party experience with special dining options that are only available on party nights, including the Holiday Wishes Fireworks Holiday Dessert Party at Tomorrowland Terrace and Holiday Wishes Fireworks Holiday Dessert Party with Plaza Garden Viewing. Tony’s Most Merriest Town Square Party – Reservations just opened for this brand-new offering at Magic Kingdom Park. This experience begins at 9:30 p.m. on Mickey’s Very Merry Christmas Party nights, and includes a tasty hors d’oeuvres and a dessert buffet at Tony’s Town Square Restaurant. At 11 p.m., you have access to a special reserved viewing area for the truly enchanting “Mickey’s Once Upon A Christmastime Parade” as it makes its way down Main Street, U.S.A. Tony’s Most Merriest Town Square Party continues until 12:30 a.m., even longer than Mickey’s Very Merry Christmas Party. Both a Mickey’s Very Merry Christmas Party ticket and reservations for Tony’s Most Merriest Town Square Party are required to attend. “The Candlelight Processional” Dining Packages at Epcot® – “The Candlelight Processional” is a holiday tradition for many Disney Guests and families. You can see the show with ease thanks to a “Candlelight Processional” dining package, which includes breakfast, lunch or dinner at a tasty Epcot restaurant plus priority seating for the show. Each meal includes an appetizer, entrée and dessert or one full buffet or family-style dining (where applicable), along with a non-alcoholic beverage. This year’s list of narrators includes newcomers Auli’i Cravalho and Alfonso Ribeiro, as well as returning favorites Neil Patrick Harris and Gary Sinise. Jingle Bell, Jingle BAM! Dessert Party at Disney’s Hollywood Studios® – Not only does this delicious dessert party dish up mouth-watering sweets, but dessert party reservations give you priority viewing for not one, but two of Disney’s Hollywood Studios’ nighttime shows – “Jingle Bell, Jingle BAM!” and “Disney Movie Magic,” as well as a greeting with a Disney character! And, last but not least … no trip to Walt Disney World Resort during the holiday season would be complete without picking up an adorable holiday Minnie Snowflake Ears Headband or Santa Mickey Mouse Ear Hat. Several new styles were just released this fall.